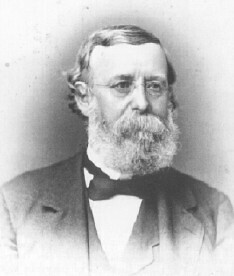 John H. Raymond, as the second president of Vassar, led the young college through its formative years and was largely responsible for the formation of Vassar’s system of education. Born in New York City in 1814, Raymond received a classical education. A long and significant relationship with education, in which he was a student, teacher, and administrative leader, began when he entered Columbia University at 14. Though he received numerous distinctions for his studies, Raymond was expelled his junior year for "causing disorder in class". Raymond describes his conduct at Columbia in his autobiography: "The spirit of insubordination, an evil spirit, a foul fiend, in whom there is no trace of manliness or generosity, took full possession of me." Raymond graduated from Union College in Schenectady in 1832 and moved on to the New Haven School of Law. A sermon that Raymond heard during this time, however, changed the course of his life. Dr. Leonard Bacon’s sermon asked, "Is religion a delusion or is it not?" Raymond’s consideration of this bold question led him to the Hamilton Baptist Theological Seminary in 1835. Within three years, he was a member of its faculty, as a professor of Mental and Moral Philosophy and a professor of English Literature. In 1850, Raymond accepted a position as a professor at Madison University (now Colgate), which he left a year later to help organize a new institution, Rochester University. During his tenure as a board member at Rochester, Raymond befriended anti-slavery reformers such as William Henry Channing, Frederick Douglass and Henry Ward Beecher. Traveling in Europe with him in 1863, Beecher called Raymond’s oratorical skill during a lecture series a "tropical tornado electrifying [the] lukewarm English audience." In 1858, Raymond was appointed president of Brooklyn Collegiate and Polytechnic Institute, a school for boys. Noting Raymond’s "praxis and wise conservatism", Matthew Vassar selected him to Vassar’s original board of trustees in 1861. After Vassar’s first president, Milo P. Jewett, resigned in April of 1864, Raymond accepted the presidency. Because Jewett resigned before the official opening of Vassar in 1865, Raymond was to be highly influential in guiding the course of the young college, in terms of structure as well as in philosophy. Raymond was a staunch believer in a comprehensive liberal education for women based on a classical curriculum. He asked his students to be thoughtful, honest, and earnest, and "not to inculcate a particular creed or system of belief, but to furnish the youthful mind with the well-established and undisputed results of past inquiry… [and] to form opinions and to understand and explain the grounds on which those opinions rest." Vassar College opened in 1865 with a faculty of nine professors and 353 students. During his 14 years as Vassar’s President, Raymond was involved in constructing the internal organization of the College, selecting the faculty, and developing a preparatory division to the school in order to better prepare the students for a rigorous college curriculum. The curriculum is perhaps Raymond’s most influential contribution to Vassar. Combating popular Victorian public opinion, Raymond was a firm believer in including scientific principles, mathematics, and modern languages into a young woman’s education. However, Raymond also believed in the importance of domestic training for women, and offered courses in "feminine employment" by making appropriate additions to what he called a "men’s curriculum": interior decoration, flower arrangement, and telegraphy. Cornelia Raymond, who became Vassar’s unofficial historian, wrote about her father: "The story of my father’s life might be the story of his friendships, and it is impossible to trace it without weaving that silver thread into the narrative." Indeed, much of Raymond’s life involved providing spaces in which people could interact and learn from one another. One of Raymond’s greatest frustrations as Vassar’s President was the Board of Trustees, chaired by Baptist minister and Vassar charter trustee Nathan Bishop. Raymond believed that the Trustees had too much power in running the college and excluded him from various administrative decisions, such as planning for college lectures. In a now famous scene, Raymond burst in and interrupted a Board of Trustees meeting in 1872 and threatened his resignation if the Trustee’s Executive Committee continued to make secretive administrative and academic decisions. Raymond was successful in the interrogation, and a freer dialogue was opened between the Board of Trustees and the President. When Raymond died in 1878 a trustee said of him: "Our President can dive deeper, swim further, and come out drier than any man I know." Harper’s Weekly remembered him as an enigmatic Baptist minister who led four institutions—Madison University, Rochester University, Brooklyn Polytechnic, and Vassar College—to prominence. The Vassar College that Raymond helped to construct would come to be the model for other female college such as Smith College and Wellesley College. As Vassar’s first active president, John Raymond was its moral and intellectual guiding light. In 1873 President Raymond wrote a comprehensive report on Vassar's first seven years. "John Howard Raymond." American National Biography. 1999 ed. "John Howard Raymond Obituary." Harper's Weekly, 7 September 1878. Life and Letters of John Howard Raymond. Ed. Harriet Raymond Lloyd. New York: Fords, Howard, & Hulbert, 1881. 32-67. Raymond, Cornelia. Memories of a Child at Vassar. Poughkeepsie: Vassar College, 1940. Raymond, Cornelia. "De Temporibus et Moribus." Vassar Miscellany, 1881. Raymond, John. Letter. Godey's Lady's Book & Magazine. 1870.